Our special commemorative coin / medallion is now available and will, we believe, become a must-have souvenir of the Cork Mother Jones Festival. 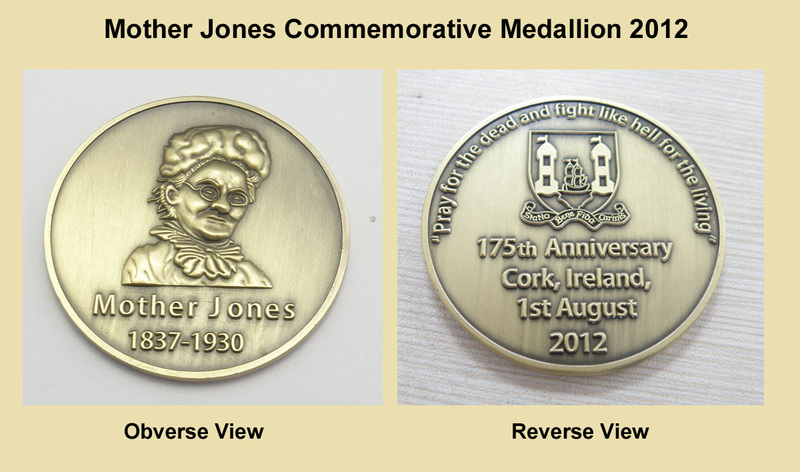 The Cork Mother Jones committee has had a very limited number of these specially designed coins for the Mother Jones 175th anniversary. The medallion / coin features an engraved image of Mother Jones on front with the legend “Mother Jones 1837 – 1930” and on the reverse side it features an engraving of the Cork City Coat of Arms with the legend “175th Anniversary, Cork, Ireland, 1st August 2012” and around the perimiter it has the famous quote from Mother Jones, “Pray for the dead and fight like hell for the living”. The Coat of Arms includes the City of Cork’s motto “Statio Bene Fide Carinis” (A Safe Place for Ships). The coins are 50mm in dimension and we are selling them at a very reasonable price of €10 (plus post and packaging for orders by post); they will be on sale during the festival but if anyone wants to order one in advance ( at the moment we can only sell one per customer), they can do so by contacting Jim ( with customer’s name, address and contact telephone number) at motherjones175@mail.com – please put the word “coin” in the subject field of your email. Or you can telephone Jim at (086) 3033576.